'Hear No Evil' Australian Deaf Dog Rescue, founded in Townsville QLD late 2014, is a tiny organisation, that has big hopes! 'Hear No Evil' are a legitimate rescue/rehoming group by ensuring every single dog that comes to us is Desexed, Microchipped and Vaccinated before being adopted, as well as Flea/Tick treated and Wormed while in our care. ‘Hear No Evil’ embark on teaching dogs basic training and manners, and offer ongoing support to any adopting families for life. ‘Hear No Evil’ even have a partnership with an assortment of dog trainers around the country to help sort out any unwanted and unhealthy behaviours. ‘Hear No Evil’ don't just rescue and rehome though, there is information and advice available to people who already have deaf dogs, and also to those people who may be interested or considering adopting a deaf dog. If you wish to get involved in any way, please contact ‘Hear No Evil’, There is always something you can do. 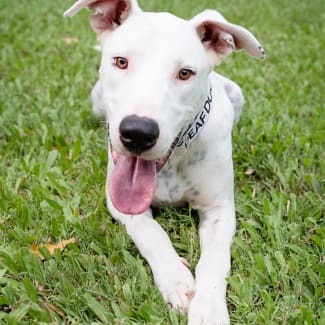 Feyre (pronounced Fay-ra) is a deaf, approximately 12 month old bull terrier cross cattle dog. 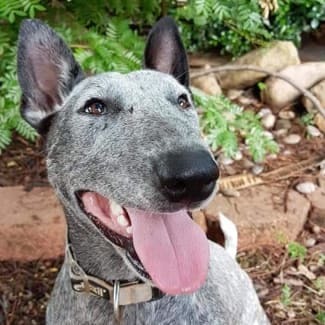 She came from a rural NSW pound a few months ago and settled into care perfectly. Despite being beautiful, Feyre isn’t just looks though, this girl is very intelligent and loves a challenge! Feyre has been learning all her basics since landing with her foster family and knows sit, drop, come and stay. She absolutely loves to carry things around in her mouth. She can also crawl, shake and jump on command. Feyre is house trained, dog social and ok with dog-savvy cats. Feyre was very timid in the pound environment but has really come out of her shell since arriving in her foster home. She is a cheeky girl and a lover of love. As such she is currently looking for her ideal match. Feyre had tried dating apps but has found that they aren’t really her cup of tea so has decided to make her must haves perfectly clear. Check below to see if you tick all the boxes to become her lucky forever family. Feyre’s must-haves include: -	Secure fencing. 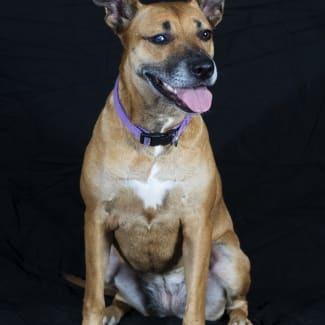 She has been known to wander off in her attempts to broaden her search for her forever family and take matters into her own paws. -	The company of another friendly dog – one that is her size or bigger. -	Any children in her home to be over 6 years of age. Feyre is fine with children but does prefer them slightly bigger. -	A home that is willing to continue her training and also to provide adequate physical and mental stimulation. Like many intelligent dogs, if left to her own devices she will become bored and destructive. -	A home where she is included as part of the family. This is a requirement for all of our dogs, but Feyre loves her people and loves nothing more than hanging out with them while they are home. -	The opportunity to go on adventures with her family. Her current favourite destination is the beach. If visiting the beach is not an option in her new home, then she will happily explore other places and then claim the perfect snuggling spot on the lounge after returning home. If you can meet all the must-haves on Feyre’s list,please get in touch. Feyre is currently located in Townsville. She is desexed vaccinated, microchipped and parasite treated. Interstate adoption is available with transport costs payable by the adopter. 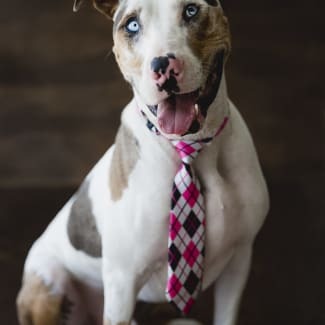 Harper is a stunning Catahoula x Bull Arab mix. At two years old, he’s well past his puppy stage and since arriving in care with HNE has proven himself to be a gentleman and a true family man. There are so many things to love about this beautiful boy. Aside from his supermodel good looks (who could resist those piercing blue eyes?!?! ), he loves naps and adores hanging out with the small people in his foster family. Harper also finds bubbles fascinating and will try to catch them with his paws! Harper loves family time and the opportunity to be involved in whatever his foster family is doing. He would benefit from living in a home where his people were around more often than not as having family close by is what brings him the most joy in life. Whilst he's happy to spend a few hours outside alone, Harper is much more content when he can be inside with his family. Primarily outdoor living is not on Harper's wish-list for his forever home. Harper doesn't ponder the question of “who's a good boy?” because he knows it’s him! He knows all of his basic obedience as well as shake, but is currently working on his 'staying power'. 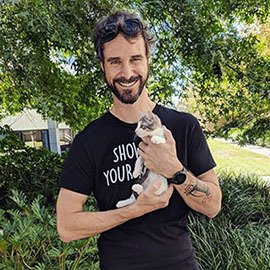 Along with absolutely adoring children, he also respects them – Harper will just as willing follow the signed commands given to him by the smallest member of his foster family as he will any adults. Harper is good with other dogs – he has previously lived with other big dogs and is currently sharing his foster home with an older medium sized dog. 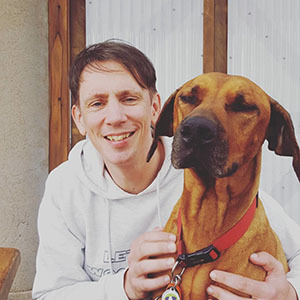 Of course, everyone has their quirks and in Harper’s case, it’s that he is a bit frightened of cats (don’t judge him – big doesn’t always equal brave!). Harper is not suited to sharing his home with pocket pets or poultry. Harper is a relatively low-energy dog - he is an easy-going boy who is content with a walk or beach visit followed by the chance to have a long nap. If someone in his family is happy to curl up and join him for that nap then Harper is the happiest boy on the planet! Thank you to Illuma Photography for the awesome photos of our handsome boy. Meet Autumn! Smart, Happy & Outgoing Autumn is 19 weeks old and was born into care along with her 8 other siblings when Mumma Bea, a Wolfhound/Bully Mix and heavily pregnant found herself in the pound and was rescued by HNE. Unlike Mum, Autumn is NOT DEAF but she did inherit her Mum's friendly good nature and smarts. Autumn is smart, happy and outgoing and is your typical puppy.smarts. She is a quick learner particularly when it comes to figuring out food puzzles. She LOVES food so using it as a means of reward has seen her basic training and lead manners progressing nicely. She is also learning to Shake and Crawl. Autumn loves a cuddle and will happily follow you around but if you're being boring she will go off on her own and keep herself entertained. If not off exploring the yard, chasing toys or playing tug of war with her doggie friends you will find her asleep in all sorts of odd places, like sprawled on her belly on the wet concrete or in the mud. Autumn has distinctive black markings with what we call ‘eyeliner’ around one eye. If you looking for a friend that will allow you your own time and space but is there for you when you need her to be then Autumn is the girl for you. 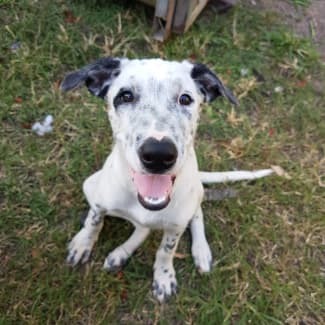 Autumn is located in Townsville QLD Autumn will be desexed at 6 months of age.